What was the 'Bloody Code'? With many prisons full – sending criminals to Australia seemed an option. Over 80 years more than 165,000 convicts were transported to Australia. 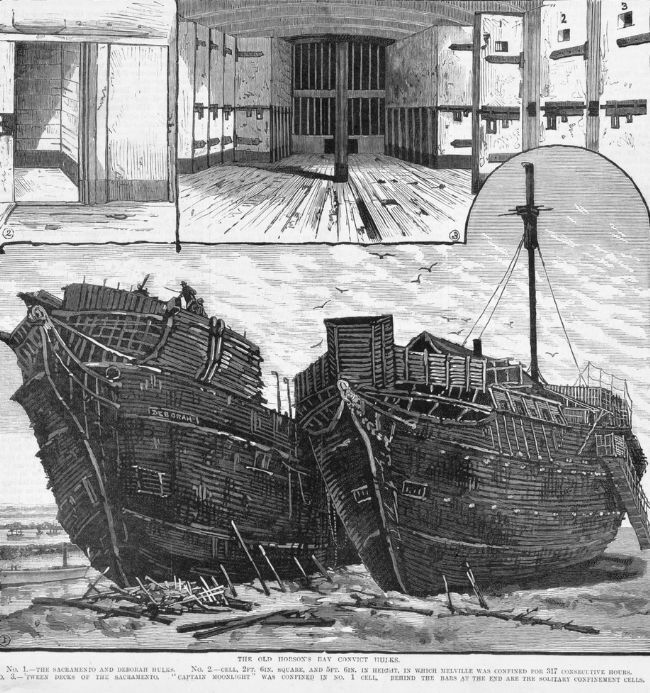 At first convicts were kept on old warships where one in three died because of terrible conditions. Many were sent to America and later to Australia. Seven out of eight of these people sent to Australia were males; some were as young as nine or ten; some were over eighty. From England the transportation ships sometimes stopped off at Gibralter, the West Indies, South America or the Cape of Good Hope, to pick up fresh water and food supplies, before they ended up at any one of the Australian penal settlements. Once in Australia, convicts lived in barracks and worked in gangs, building roads and bridges or working on farms or quarries. Some were sent out to work for farmers. If they behaved themselves, their sentence could be reduced by a 'ticket of leave.' The majority of convicts decided to stay in Australia at the end of their sentences, recognising that they could make a better life there than returning to Britain and, probably, poverty and crime. Rich criminals were not sent to Australia as they could afford to pay a fine instead of being transported.